Hello everyone! It's Sunday and we have another card challenge for you over at Red Carpet Studio. Our challenge this week is a card challenge - create a card featuring a pumpkin or another element of Halloween. Anything goes! 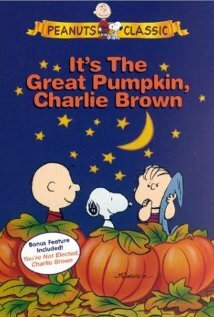 This week's challenge is inspired by "It's the Great Pumpkin, Charlie Brown." I was on Catherine Pooler's website and saw where she made a one layer card that included some score marks as design elements. I used Cardz TV Stamps "Fall Fun" for the image and sentiment. I used my PrismaColor markers to color in my image. Don't forget there is a GIVEAWAY going on until Nov. 15th! Couture Stamping Academy now has 25 new members, and exclusive video with more to come, and card samples. Join the community and share in the fun! Simply adorable! Thank you for joining us at MIM this week! Remember, to be in the running to win the prize from our sponsor this week just leave a comment for another entry. Be sure to mention you saw them on Make It Monday. The more entries you comment on the more chances you have of winning! I like the clean look of your Halloween card! I came over from MIM to visit.